These days, floral head-dresses aren’t just confined to weddings – although they do look fabulous for brides and bridesmaid! Thanks to a resurgence of school proms, black tie dinners and generally a party for every occasion, the floral head-dress is really coming into its own as an outfit accessory. They add a touch of glamour and elegance to any old hair-do and ensure that the wearer is that little bit different and stands out in a crowd. You can add feathers, beads, skeletonised leaves or decorative wire. A floral head-dress like this is basically a corsage stuck onto a comb - they are also very simple to make. Always think minimum effort for maximum effect! The head-dress should always complement what the wearer has on and reflect their age. A design such as this is more suited to an older teenager or young woman. There are a few things to bear in mind when creating a head-dress like this. If you are using fresh flowers – and you really should to get the full effect – make sure they are quite sturdy. They have got to be able to put up with generally all sorts of warm conditions and the last thing you want is for them to droop. Carnations, roses, hyacinth pips or gerbera are a fairly safe bet. Also, avoid any prickly foliage for obvious reasons! Remember not to make the design too heavy as this could pull at the hair and become very annoying by the end of an evening out. This could prove extremely uncomfortable and therefore not create the look you want. The accessory can either be glued or wired onto a comb. If you are wiring ensure that the wires are pointing away from the head to avoid any injury! And if you are glueing, make sure the glue is totally dry before you place it in the hair. This actual design would be perfect for someone with long hair, although it can be adapted for some with shorter hair by removing the wired silk petals. In this instance it can be worn on the back of the head or the side. 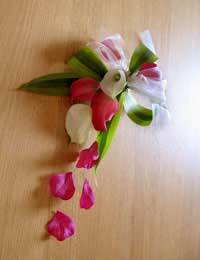 Four small cala lilies; Leucadendron leaves (or the lily leaves if they are strong enough); wires; tape; cream organza ribbon; decorative bead wire; silk petals; hair slide.